Norwegian junior rider Alexandra Andresen made a clean sweep of the junior section at the 2013 Arctic Equestrian Games CDI in Vestfold, Norwat, claiming victory in the team championship, individual and Kur tests each time with scores above 70%. Aboard her Westfalian licensed stallion Belamour the 2012 Norwegian Junior Riders' Champion Andresen made experience count. "The Vestfold CDI went very well for me," the 16-year old Alexandra told Eurodressage. "I got 72,5%, 72,8% and 74,5% in the Kur, and three first places, so I am very happy with Belamour. Purchased early in 2012 by Alexandra's mother, the 8-year old Westfalian branded chestnut stallion Belamour (by Belissimo M x Lord Sinclair), is proving to be a very good buy. "Belamour is a very calm and friendly stallion. He is polite and has a lot of personality," said Andresen. " I purchased him because when I rode him I could not stop smiling. He gives the rider an amazing feeling. He uses his whole body in every gait and movement. His temperament is also unbelievable for a stallion." Searching for a "first junior horse", Alexandra's mum picked Belamour because of his sweet nature and also his potential to breed more top dressage horses. "He is currently being used as a breeding stallion too and has been put to quite a lot of mares here in Norway, but he is also licensed in Norway, Denmark, Sweden and Germany," Alexandra said proudly. Certain that she has found her perfect match, Alexandra admitted that if Belamour were human, he would be "her boyfriend" as she thinks their personalities match extremely well. However if he could speak "he would tell me that he just wants to be ridden in the forest every day, as he loves cantering full speed," Alexandra laughed. Working out of stable Tatum near Oslo, Alexandra also has some other talented men waiting in the wings just to be sure her boyfriend doesn't get too comfortable playing number one! "I also have De Noir, a 13-year old De Niro gelding, and Swix, a 7-year old Sandro Hit stallion," she said. 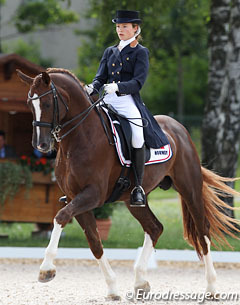 Trained by Anny Hilde Lindén for many years, Alexandra gives all credit to her and Belamour for her results. Alexandra is certain that her trainer knows her very well and also likes what the junior star stands for! "Together we are a great team," she stated. "We also share the same opinion on how we want the horse to go, and our method of training is quite basic. I work on suppleness, activity and tempo changes. I don't want to work too much when I ride. I want the horse to carry itself and be electric to my aids." At 16 Alexandra has a big future ahead of her and although it has been quite difficult for her to balance riding with school and friends, she knows that with any dream comes certain compromises. "I have had to sacrifice a great deal of social life to be able to ride this much, but you have to be willing to give it your all, and have the right attitude, to do well," said the level-headed Andresen. "Winston Churchhill once said that 'attitude is a small thing, that makes a big difference'. I think it is important to always be humble and willing to learn more, no matter how good you are." With the aim to compete in Roosendaal, the Nordic Baltic Championship, the European Championship and the Norwegian Championship throughout 2013, Alexandra has a busy year ahead and hopes to improve on her results even more! "I have a good team with supporting family, trainer and good horses, together anything is possible," she declared.